This article is about the brandy. For the town, see Cognac, France. Cognac (/ˈkɒnjæk/ KON-yak or /ˈkoʊnjæk/ KOHN-yak ; French pronunciation: ​[kɔ.ɲak]), named after the town of Cognac, France, is a variety of brandy. It is produced in the wine-growing region surrounding the town from which it takes its name, in the French Departements of Charente and Charente-Maritime. For a brandy to bear the name Cognac, an Appellation d'origine contrôlée, its production methods must meet certain legal requirements. In particular, it must be made from specified grapes (see below), of which Ugni blanc, known locally as Saint-Emilion, is the one most widely used. The brandy must be twice distilled in copper pot stills and aged at least two years in French oak barrels from Limousin or Tronçais. Cognac matures in the same way as whiskies and wine when aged in barrels, and most cognacs are aged considerably longer than the minimum legal requirement. The region authorised to produce cognac is divided into six zones, including five crus broadly covering the department of Charente-Maritime, a large part of the department of Charente and a few areas in Deux-Sèvres and the Dordogne. The six zones are: Grande Champagne, Petite Champagne, Borderies, Fins Bois, Bon Bois and finally Bois Ordinaire. A blend of Grande and Petite Champagne Cognacs, with at least half coming from Grande Champagne, is known as Fine Champagne. 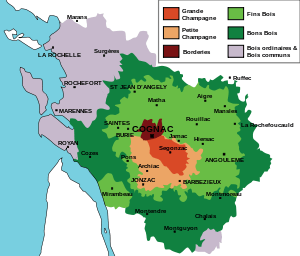 Cognac-producing regions should not be confused with the northeastern region of Champagne, a wine region that produces sparkling wine by that name, although they do share a common etymology – both being derivations of a French term for chalky soil. Cognac is a type of brandy and, after the distillation and during the aging process, is also called eau de vie. It is produced by doubly distilling white wines produced in any of the designated growing regions. The white wine used in making cognac is very dry, acidic and thin. Though it has been characterized as "virtually undrinkable", it is excellent for distillation and aging. It may be made only from a strict list of grape varieties. In order for it to be considered a true cru, the wine must be at least 90% Ugni blanc (known in Italy as Trebbiano), Folle blanche and Colombard, while up to 10% of the grapes used can be Folignan, Jurançon blanc, Meslier St-François (also called Blanc Ramé), Sélect, Montils or Sémillon. Cognacs which are not to carry the name of a cru are freer in the allowed grape varieties, needing at least 90% Colombard, Folle blanche, Jurançon blanc, Meslier Saint-François, Montils, Sémillon, or Ugni blanc, and up to 10% Folignan or Sélect. After the grapes are pressed, the juice is left to ferment for two or three weeks, with the region's native, wild yeasts converting the sugar into alcohol; neither sugar nor sulfur may be added. At this point, the resulting wine is about 7% to 8% alcohol. Distillation takes place in traditionally shaped Charentais copper stills, also known as an alembic, the design and dimensions of which are also legally controlled. Two distillations must be carried out; the resulting eau-de-vie is a colourless spirit of about 70% alcohol. Once distillation is complete, it must be aged in Limousin oak casks for at least two years before it can be sold to the public. It is typically put into casks at an alcohol by volume strength of about 70%. As the cognac interacts with the oak barrel and the air, it evaporates at the rate of about three percent each year, slowly losing both alcohol and water. 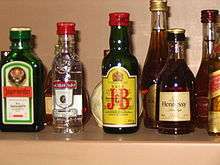 Because the alcohol dissipates faster than the water, the alcohol concentration drops to about 40% over time. The cognac is then transferred to large glass carboys called bonbonnes, then stored for future blending. Since oak barrels stop contributing to flavor after four or five decades, longer aging periods may not be beneficial. The age of the cognac is calculated as that of the youngest component used in the blend. The blend is usually of different ages and (in the case of the larger and more commercial producers) from different local areas. This blending, or marriage, of different eaux-de-vie is important to obtain a complexity of flavours absent from an eau-de-vie from a single distillery or vineyard. Each cognac house has a master taster (maître de chai), who is responsible for blending the spirits, so that cognac produced by a company will have a consistent house style and quality. In this respect it is similar to the process of blending whisky or non-vintage Champagne to achieve a consistent brand flavor. A very small number of producers, such as Guillon Painturaud and Moyet, do not blend their final product from different ages of eaux-de-vie and therefore produce a "purer" flavour (a practice roughly equivalent to the production of single malt Scotch whisky). Hundreds of vineyards in the Cognac AOC region sell their own cognac. These are likewise blended from the eaux-de-vie of different years, but they are single-vineyard cognacs, varying slightly from year to year and according to the taste of the producer, hence lacking some of the predictability of the better-known commercial products. Depending on their success in marketing, small producers may sell a larger or smaller proportion of their product to individual buyers, wine dealers, bars and restaurants, the remainder being acquired by larger cognac houses for blending. The success of artisanal cognacs has encouraged some larger industrial-scale producers to produce single-vineyard cognacs. A VS ("very special") cognac that has been aged for at least two years in cask. V.S. ("very special") or ✯✯✯ (three stars) designates a blend in which the youngest brandy has been stored for at least two years in cask. V.S.O.P. ("very superior old pale") or Reserve designates a blend in which the youngest brandy is stored for at least four years in a cask. XO ("extra old") or Napoléon designates a blend in which the youngest brandy is stored for at least six years. In 2016, the minimum storage age of the youngest brandy used in an XO blend will be set to ten years. Hors d'âge ("beyond age") is a designation which BNIC states is equal to XO, but in practice the term is used by producers to market a high-quality product beyond the official age scale. The names of the grades are in English because the historical cognac trade, particularly in the 18th century, significantly involved the British. The tightly defined crus, or geographic denominations where the grapes are grown, with their distinctive soils and microclimates (perhaps atypical of the larger region), can also be used to classify the cognac, as these factors can produce eaux de vie with characteristics particular to their specific location. Grande Champagne (13,766 hectares (34,020 acres)) Grande Champagne eaux de vie are long in the mouth and powerful, dominated by floral notes. "Champagne" derives from the Roman "Campania" meaning the southern region of Italy considered the countryside of Rome, but is often explained with similarity in soil with the Champagne area at Reims. The soils in Grande Champagne and Petite Champagne are characterized as shallow clay-limestone, over limestone and chalk. Petite Champagne (16,171 hectares (39,960 acres)) Petite Champagne eaux de vie have similar characteristics to those from Grande Champagne but are in general shorter on the palate. Cognacs made from a mixture of Grande and Petite Champagne eaux de vie (with at least 50% Grande Champagne) may be marketed as "Fine Champagne". Borderies (4,160 hectares (10,300 acres)) The smallest cru, eaux de vie from the Borderies are the most distinctive, with nutty aromas and flavor, as well as a distinct violet or iris characteristic. This denomination's soil contains clay and flint stones resulting from the decomposition of limestone. Fins Bois (34,265 hectares (84,670 acres)) Heavier and faster aging eaux de vie ideal for establishing the base of some blended cognacs. Fins Bois is rounded and fruity, with an oiliness. The soils here are predominantly red clay-limestone and very stony, or otherwise heavy clay soils. Bons Bois and Bois Ordinaires (together 19,979 hectares (49,370 acres)). Further out from the four central growth areas are these two growing regions. With a poorer soil and very much influenced by the maritime climate, this area of 20,000 hectares produces eaux de vie that are less demonstrative and age more quickly. The soils of Les Bois (Bons Bois, Bois Ordinaires, and Bois à terroirs) are sandy, spanning coastal areas and some valleys. While there are close to 200 cognac producers, a large percentage of cognac—more than 90% for the US market, according to one 2008 estimate—comes from only four producers: Courvoisier (owned by Beam Suntory), Hennessy (owned by LVMH), Martell (owned by Pernod Ricard), and Rémy Martin (owned by Rémy Cointreau). Other brands meeting the AOC criteria for cognac include: Bache-Gabrielsen/Dupuy, Braastad, Camus, La Fontaine de La Pouyade, Château Fontpinot, Delamain, Pierre Ferrand, Frapin, Gautier, Hine, Marcel Ragnaud, Moyet, Otard, Meukow, and Cognac Croizet. 1 2 Hacker, Richard Carleton (23 February 2006). "Elegance in a glass". San Francisco Chronicle. Retrieved 1 December 2010. ↑ Bespaloff, Alexis (14 March 1977). "The Noblest Brandy of them All". New York. p. 79. ↑ In French, eau-de-vie means "brandy" (any brandy). 1 2 3 4 5 6 7 8 9 10 Lukacs, Paul. "How Good is Cognac?". Saveur (22). Retrieved 1 December 2010. ↑ "Appellation of Origin". Bureau National Interprofessionel du Cognac. ↑ "Harvesting and vinification". Bureau National Interprofessionel du Cognac. 1 2 Koscica, Milica (April 2004). "TED Case Studies – Number 728". Trade Environment Database. American University, School of International Service. Retrieved 1 December 2010. ↑ "Single Estate Cognac". 2009. Retrieved 21 July 2009. ↑ "FAQ". Retrieved 6 October 2014. 1 2 3 4 Steinberger, Mike (2 April 2008). "Cognac Attack!". Slate. Archived from the original on 2011-05-11. Retrieved 8 May 2013. Wikimedia Commons has media related to Cognac.